Ribbon leeches are commonly used fish bait that brown, rainbow and brook trout gobble up with relish. The ribbon leeches are not bloodsuckers but rather scavenge for dead animals and prey on aquatic insect larvae and worms. 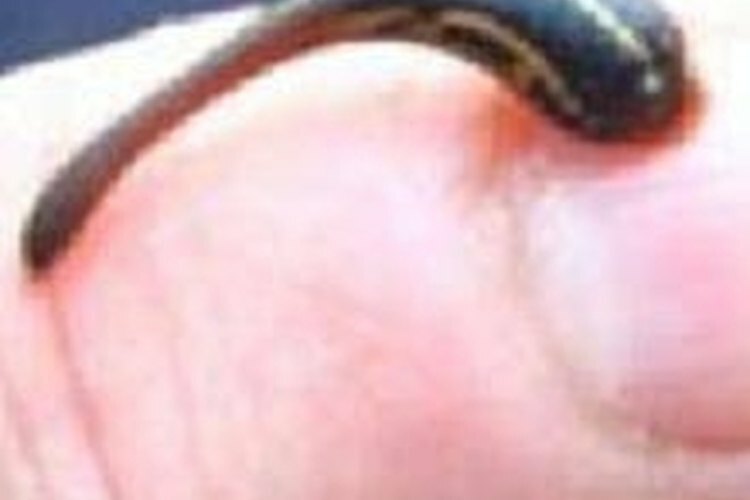 The best place to catch leeches is in a lake or pond uninhabited by fish. They can be trapped and caught with any device that provides a surface that they can stick to and contains a few pieces of meat. This trap will cost you nothing to make and is a surefire method for trapping leeches. Put the fish head or meat bait in an empty coffee can. Squeeze the open end of the coffee can so that it's almost shut to keep the bait from floating out of the trap. Poke a hole through the squeezed ends of the can and thread a 3- or 4-foot length of fishing line through the hole. Tie the fishing line to secure it to the can. Create a floating marker for the trap by tying the other end of the fishing line to a block of Styrofoam. Completely submerge the trap in knee-deep water where the bottom is silty or muddy. Leave the trap there overnight but make sure you return early the next morning. Leeches are nocturnal feeders and will leave the trap by sunrise. Remove the trap from the pond the following morning. Fill a small thick-walled styrofoam cooler with some of the pond water, and empty the trapped leeches into the cooler. You can store them for up to a week in the refrigerator as long as you change the pond water every other day or so. Don't feed them because you'll foul the water. Bloodsuckers make lousy fish bait. They are soft-bodied, while ribbon leeches feel firm when you touch them. Know and abide by your local laws regarding the trapping of leeches.